104 Landscape Architect and Specifier News 2016 Specifier's Guide lighting Lighting Poles / Aluminum Lighting Poles / Wood See Ads on pages 112, 123 Information Request # 9016 Mel Northey Co. 800-828-0302 melnorthey.com Concord residential grade total cast aluminum lamp posts and bases. 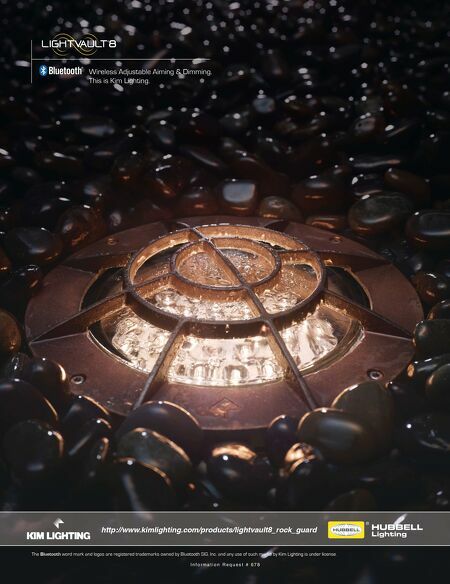 Lights are to be installed onto a cement pad the depth of your local frost line. Cast aluminum post with clean lexan polycarbonate globe, incandescent lighting with optional high pressure sodium or metal halide. 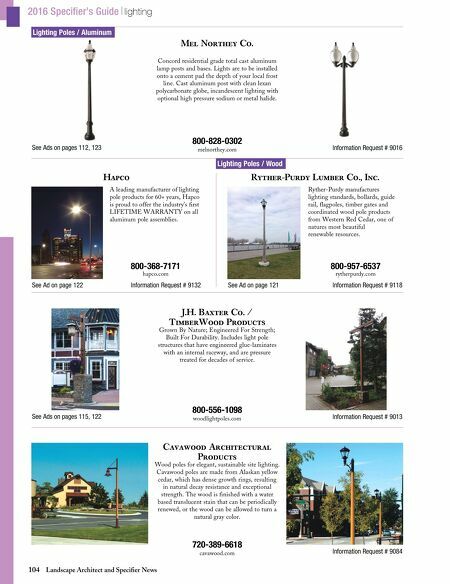 See Ad on page 122 Information Request # 9132 Hapco A leading manufacturer of lighting pole products for 60+ years, Hapco is proud to offer the industry's first LIFETIME WARRANTY on all aluminum pole assemblies. 800-368-7171 hapco.com See Ad on page 121 Information Request # 9118 Ryther-Purdy Lumber Co., Inc. Ryther-Purdy manufactures lighting standards, bollards, guide rail, flagpoles, timber gates and coordinated wood pole products from Western Red Cedar, one of natures most beautiful renewable resources. 800-957-6537 rytherpurdy.com See Ads on pages 115, 122 Information Request # 9013 J.H. Baxter Co. / TimberWood Products 800-556-1098 woodlightpoles.com Grown By Nature; Engineered For Strength; Built For Durability. Includes light pole structures that have engineered glue-laminates with an internal raceway, and are pressure treated for decades of service. Information Request # 9084 Cavawood Architectural Products 720-389-6618 cavawood.com Wood poles for elegant, sustainable site lighting. Cavawood poles are made from Alaskan yellow cedar, which has dense growth rings, resulting in natural decay resistance and exceptional strength. The wood is finished with a water based translucent stain that can be periodically renewed, or the wood can be allowed to turn a natural gray color.